This project was mentioned in Episodes 54 and 55 as a conversion project I was working on at the time. In Episode 55 I gave it the code name of Santa’s Slay for fun but as you can see it is my Black Coach. It took quite a while to get all the little bits done but overall it is a pretty simple conversion. Although it seems a lot of people like the look of it I have never played with the coach before because the model was so boring and out of place looking on the battle field. I have been reading The Vampire Wars and one part has to do with the Sylvanian coaches and the dread and fear they instill which is what spurred my interest for the model. I don’t know exactly how I came up with the conversion idea but I have seen plenty of flying coaches converted and even more that just have different steeds swapped in. This all adds to making the model interesting and at some point I saw the potential use of the Mortis Engine kit. 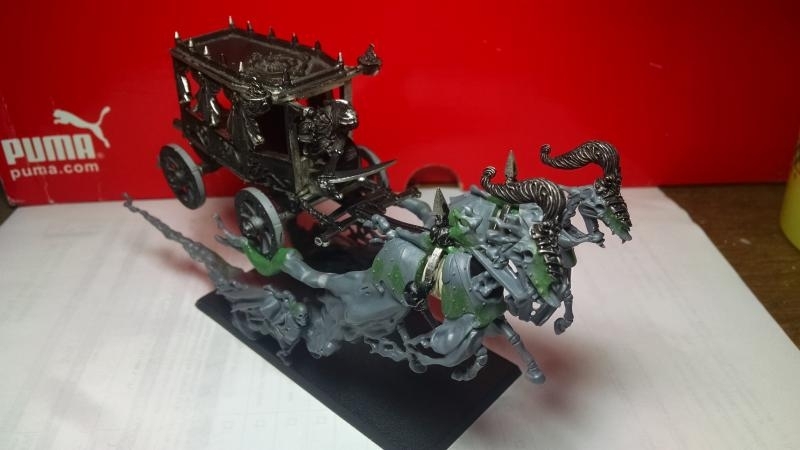 It is pretty obvious and like I said the conversion just uses the steeds and lower part of the spirit hoard from the Mortis Engine and the rest of it is the regular coach. 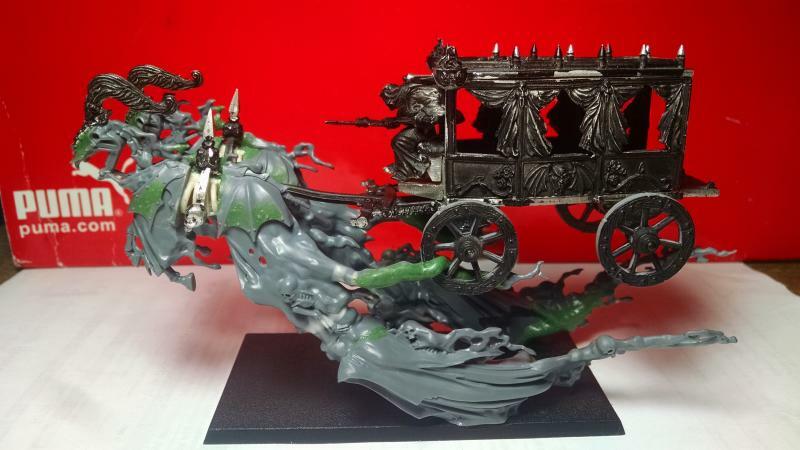 My coach happens to be metal and I got it second hand from ebay for this conversion. I was worried about the weight a bit when I started but as this model progressed it became very solid and sturdy. The coach is not altered at all and the steeds were the brunt of the conversion work. 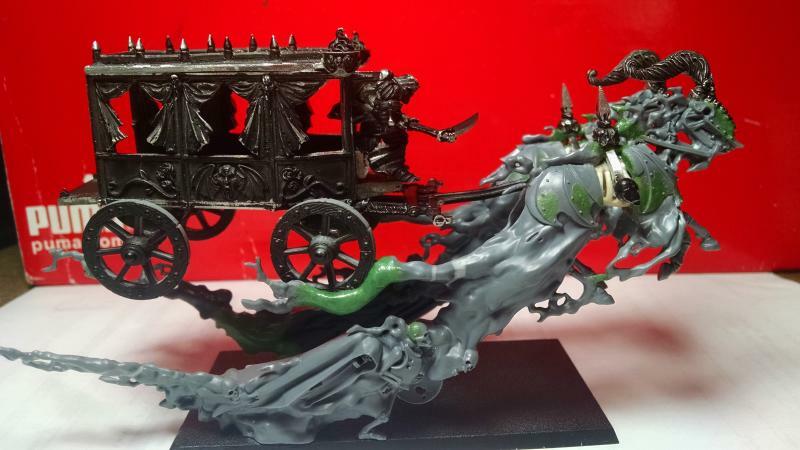 The normal Mortis Engine has three black knights leading the spirit hoard flying at the front that trail into the lower part that actually supports the whole thing at the base. So it was just a matter of separating the back two steeds and eliminating the riders. For the most part the three knights are all separate pieces in the kit. The left side steed I did first and went easy but the right side wasn’t the best. That one actually joins to the third knight at the front on the one side. Separating them was alright but I ended up not liking the look of it because it was more engulfed by the magic cloud and looked odd especially compared to the other steed. To remedy this I actually used the front half of the steed from that third foremost knight. The other thing was eliminating the riders; which seemed pretty simple. Cutting all the parts of the rider off was definitely easy but making the steeds look right after took some work. In some cases I was able to carve the plastic to make the barding look right but a fair amount I had to green stuff back in. Then another issue was the rib cage part of the steed. 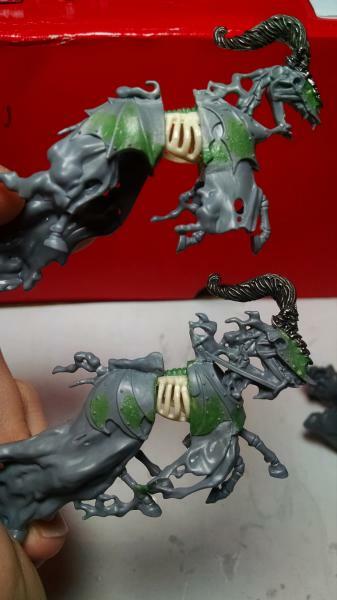 When I set out doing this I figured once I clipped the rider off I would just fill the big hole with green stuff and re-sculpt the ribs. What I ended up doing was using the rib cages from some old skeleton steeds. Not sure that it was faster or less work but they fit pretty well and the hollowness was cool even though most of it ends up covered. 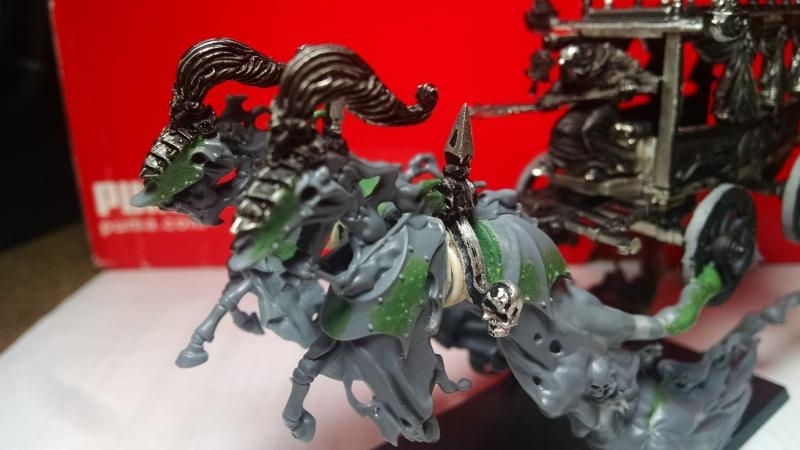 I also added in a spine to each steed with green stuff and covered all the corrosion marks in the barding because I wanted a cleaner look. I had to shave the horses heads a bit to fit the headdresses for the coach and then green stuffed to blend it to hopefully look like one piece with the armor that was on them already. You can see the horses done in the only bit of WIP that was worth pics. Once the steeds were done I attached them to the harness bit that holds them to the coach. I had to add some green stuff to complete the spirit cloud going through the harness. I then glued a pinned the tongue to it which was already attached to the front axle and wheels. Upon doing that I noticed how the part that normally attaches the top part of the hoard lined up really well to the wheels. At this point I got the idea to actually attach the magic cloud right to the coach. I liked that it tied the pieces together more and actually is enough to support the coach eliminating the need of a support rod. I clipped the end of the cloud trails off these parts and glued them to the back of the front wheels. I used green stuff to extend the cloud to the wheels and intertwined it through the spokes on the one side and so the wheel is kinda riding over it on the other. I am undecided if I should trouble to add more skwiggly bits to the middle of this or if it is fine how it is. From there was mounting this all to the lower bits of the hoard and to the base. Normally the lower hoard parts are fit together but in this case they are spaced out to the edges of the base because the steeds are farther apart. 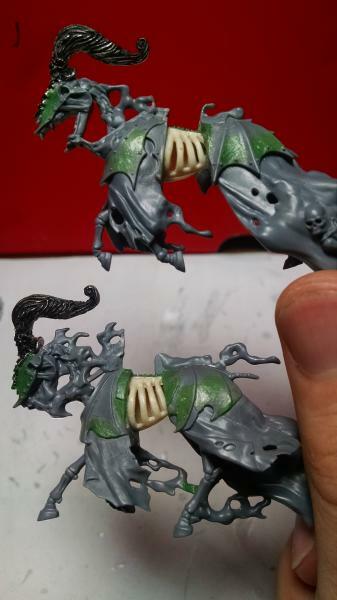 I did some filling with green stuff to cover the spaces on their back sides that were made to join them. The steed parts attached to the lower spirit hoard in the normal spot but I glued them at a slightly different angle because it originally made the coach sorta nose diving. I did the right side one first because it fit best and then it took some bending of the other side to get it to align to allow the lower portion to fit the base. Then all that was left was building the rest of the coach. I did take a couple cloud trail bits off of a shield from the Mortis Engine sprue and added them to the back wheels. It took a bit of green stuff to fill them out and I did it to tie the whole model together a bit more. You can see I put it all on a chariot base which is usually too small for the coach. It was easy with how I have it built to put it on there and of course over hangs but I spaced it evenly and it doesn’t seem excessive. 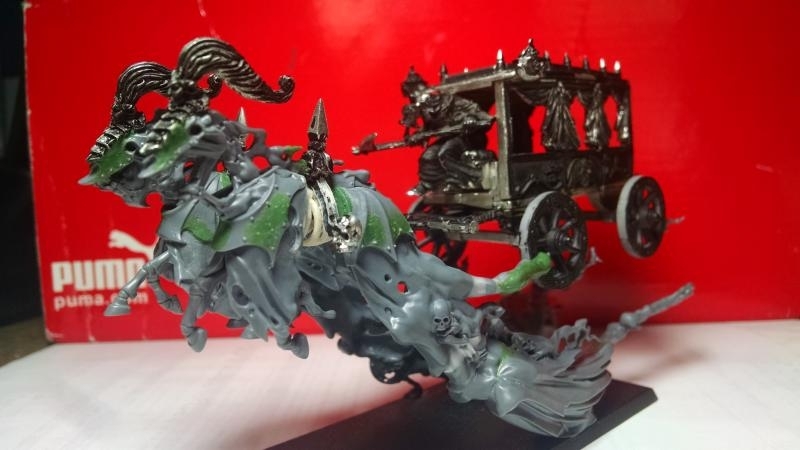 I wonder in hindsight if this could of been just as good using regular hex wraith steeds or how well the bit of spirit hoard matches the model. I reasoned that if it is necromantic magic making it fly there would just as well be spirits and such as part of it. In the end I think it looks pretty cool and can’t wait to get some of these new things painted. I’m excited to get this on the table and hopefully accomplish something useful with it for the work I put forth. It seems pretty tough and will probably use it for supporting charges, taking out chaff or maybe even small knight units. Maybe when it is powered up and ethereal it can take on some monsters and the like too. Too bad chariots can’t march or it would be awesomely mobile once it can fly. Thanks for looking! 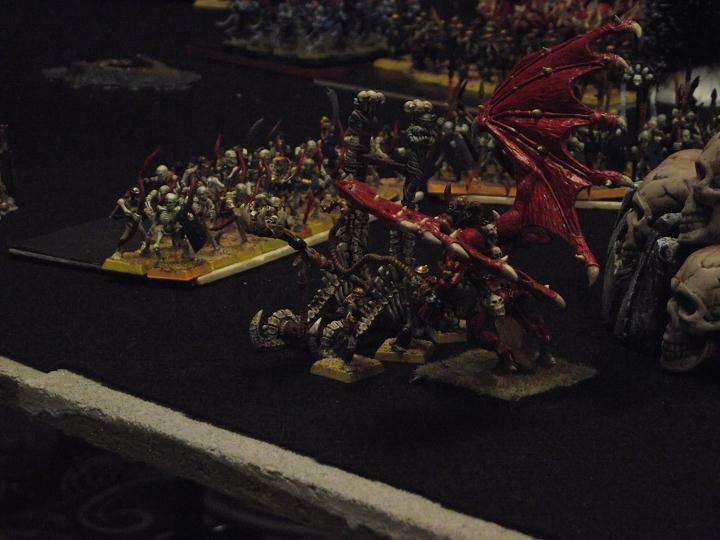 Please feel free to email me at hosts@wiscodice.com or follow this link to the WWHFB forum if you have comments or feedback.